When I signed up for NaNoWriMo in 2011, I was very excited. 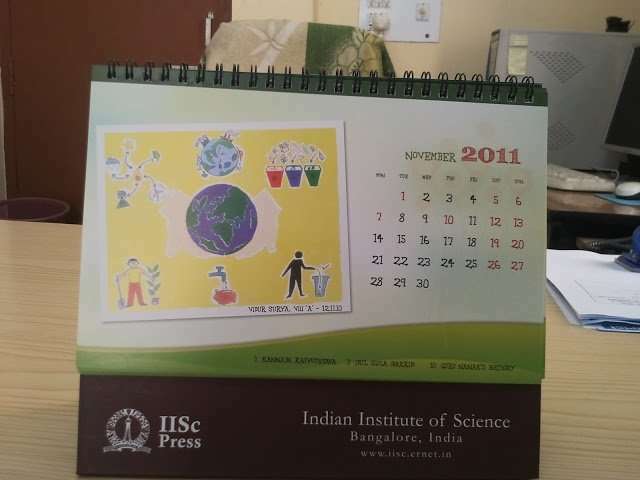 For extra motivation, I had this calendar to refer to – a painting by my son which was featured in the IISc desk calendar for the month of November. I validated on November 28, 2011, and had a feeling of jubilation like no other. Oh, the adrenalin rush! I was holding the draft of my very own non-fiction book. Of course, it had miles to go before it met its publisher, but that was okay. Still has, in fact. It is that sort of book. I was a woman on a mission – committed to write 50,000 words in thirty days, from November 1 to 30, and I was eager to get started. And by the way, lest you feel intimidated by 50,000 words – don’t worry. It really is not a lot. Not when you’ve made up your mind to write. 50,000 words divided by 30 days is an easy 1667 per day. If you would like to take Sundays off, it is 1924 words a day – but I do not recommend taking any days off. Let it flow, I say. And do not feel bound to only stick to that word count. I know of people (including me) who can churn out 6000 a day easily when they settle down to it. The trick is to make use of every moment you can get. You’ll thank yourself. Very profusely. You do know you can’t turn the clock back, right? I love a good challenge especially of the writing kind! So here we go, in random order. Get enough sleep. we function better when we’re well rested. When we are not, we are no good to anybody, least of all ourselves. Ugh. Early riser? Great! put in a couple of hours of writing with zero interruptions from phone calls and doorbells. Spend less time online. Email, social media, instant messaging are all time stealers – quite like empty calories. Create some sort of discipline about when you’ll spend time online, make a plan and stick to it. No cheating. I am a list person. I account for every waking hour. I have to, juggling two jobs. I can’t afford to regret lost time. So I plan ahead. I don’t cry over spilled milk. I just prefer to clean it up and move on. Eat healthy. So shop healthy. Plan your week’s meals in advance to help you shop easily. I’ve identified a great place to order online and have it home-delivered to save time, effort and, bruha-ha-ha, money! So I’ll miss the chit chat at the supermarket, but I think they’ll manage fine without me. For November anyway. Get exercise. Go for a walk, do yoga. Meditate. Whatever floats your boat. Healthy mind, healthy body. Take breaks, even if it means sitting/lying down quietly/listening to music for 15 minutes. Read your favorite authors and books. My breaks usually revolve around housework, cooking, reading, music, painting and photography. Make a schedule and stick to it as much as you can. Prioritize. do what you gotta do. push everything else to next month. and this from me, someone who does not believe in postponing things. making an exception for november though, after taking a good look at what i absolutely have to do. client work is non-negotiable, naturally. what i can finish in october, I will. what i can push to december, i will. except emergencies, the focus for November will be NaNoWriMo. Let your family know so they can support you, motivate you, encourage you. Delegate things you have no time to do – that’s what family and friends are for. Practice writing even if you can’t take your book / your story ahead. Keep track of your word count. Take backups often. http://wordcounter.net is a decent word count tool. I write in Word and save it all in text files as well. Tell your inner critic to take a vacation and never come back! Are there benefits of participating in the NaNoWriMo? You bet! You produce a book! Imagine! If you’ve always dreamed of writing that book, now is the time to grab your keyboard / pen and get to it. And remember, validation at nanowrimo.org is from Nov 25 to 30. Don’t miss that deadline like I did last year. I sat on my fanny, like that hare in the hare and tortoise story – I finished the required word count half way through November and continued to write…but what with some stuff at work, I totally missed Nov 30 and felt quite sheepish. Still, I have my book, so that’s okay. Still, it feels better when you’ve validated, eh? “NaNoWriMo is an annual (November) novel writing project that brings together professional and amateur writers from all over the world. Any one can sign up for the NaNoWriMo. Your story is waiting to be written. I’m not quite if I’m ready for a full on novel, Vidya, but am trying to stick to a regular writing word count of 500+ words a day for my blog All the tips you suggest for this month of writing, I can use for my everyday writing as well. Scheduling in my writing and exercise helps my writing like nothing else out there! Vishnu recently posted…Allow Love to Bloom: 12 Sensible Reasons to have an Arranged Marriage. Vishnu, while I always dreamed of writing a book, I also realized that there is no such thing as the right moment! You are always ready – all you have to do is write. 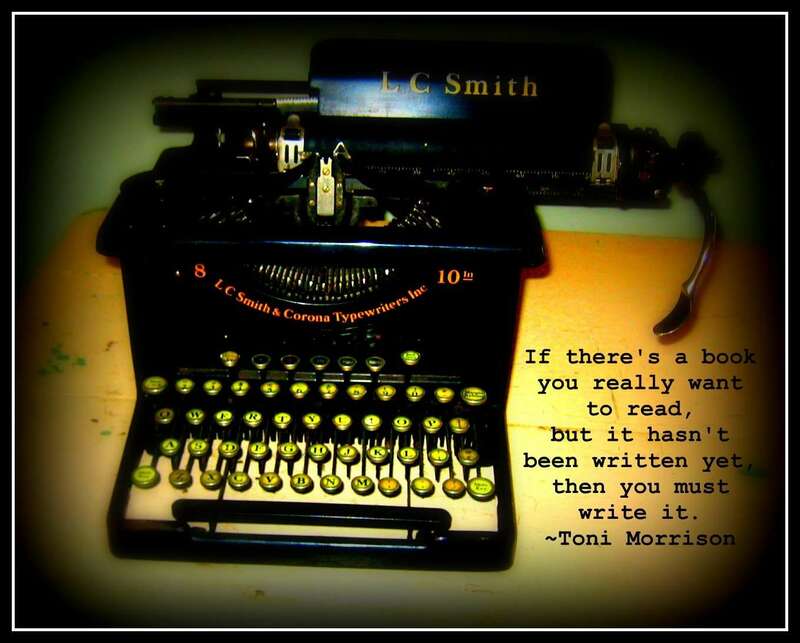 And I’ll bet your book will be awesome – you write so well! It only takes a shift of mindset – and suddenly you’ll feel a sense of freedom. 🙂 Go ahead. Do it. Forget NaNoWriMo – that’s just a push. Write for yourself. Hugs! Corinne, thanks! 🙂 No reason not to do it when you are back. Let’s plan it and buddy up! Hugs! I love this encouragement and excellent tips, Vidya! I’m not drawn to writing fiction, but I could easily use the framework to produce another form of writing. I’m so excited by your accomplishment and enthusiasm. Makes me want to go for it! Sandra, please do go for it! Another ecourse, perhaps? Some of your posts from your fabulous blog edited and bundled into a themed inspiring book?. In fact, I suspect I am far better at non-fiction and memoirs than fiction. 🙂 I can write the short story on occasion, but I don’t try very hard. I enjoy musing on life, though. Please consider writing! There’s something magical about NaNoWriMo for me, sort of like a group prayer – know what I mean? 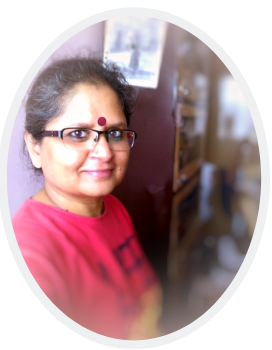 Vidya Sury recently posted…And before I knew it, I had hit ‘Send’. Hi Vidya, firstly congratulations for your book! Inspired by you and another fellow blogger, I have signed up for NaNoWrimo but I’m so tensed. I’m not huge on frequent blogging, how will I manage daily writing. Yes, priority is the key! Your post has helped me to muster up the courage to at least get started. Hope to go with the flow, and see where I go…. Good for you Vidya, I wish you the best of luck with November! At least it is not December. I have just started my own blog so I am not close to taken such a challenge on! Enjoy yourself, I have no doubt you will pour yourself into it! Loved your angry pig princess DIY costume! So happy we’re connected! You have book(s) coming out!!! I didn’t know about that at all, although I am not surprised. Good for you, and now I know why you kept gently pushing me to participate in NaNoWriMo. How does one sign up for NaNoWriMo in the first place though? You know my mail id jairammohan at gmail dot com Please do let me know, I am giving NaNoWriMo some serious thought. :-)I know you’ll enjoy the experience, Jairam. Really, there’s no pressure, except our own positive one from within, as we write. The sign up link is at the end of the post – here it is again https://nanowrimo.org/en/sign_up – takes two seconds and you’re ready to go! 🙂 Looking forward to doing it together. Like some others, I am not a fiction writer, but I support you completely in taking this challenge. Can’t wait to read your novel! Galen, hugs! I suspect I too am not much of a fiction writer, mainly due to a lack of patience. That is why i drafted the health guide for women in my first NaNoWriMo (2011). In 2012, though, I wanted to attempt fiction, but found myself getting stuck, so resorted to a memoirs-type book. This year, I’ll be writing non-fiction – some short books as well as letters to my Mother. It is what comes easily to me, and I have so much to say! Thank you. You are one of my prime sources of encouragement – this year, more than ever. Hugs! Thanks to you, I visited the website. Very interesting, but I’ll give it a miss this year, unless I change my mind by October 30! All the best to you, Vidya! If it’s permitted (is it? ), do you plan to submit 2 novels this year? Oh yes, on Nov 25, 2013, I’ll remind all friends who are participating that they have to upload their novels by November 30! Pro – I do hope you decide to do! We don’t “submit” anything. We just validate the 50000 word limit by copying and pasting what we write into the word count tool on the site, which qualifies us to receive the “winner” certificate. Which really means that typing asdfg X 10,000 times = 50000 also qualifies, you know what I mean? The word count tool on their site does not retain our novels – it is simply a validation mechanism. 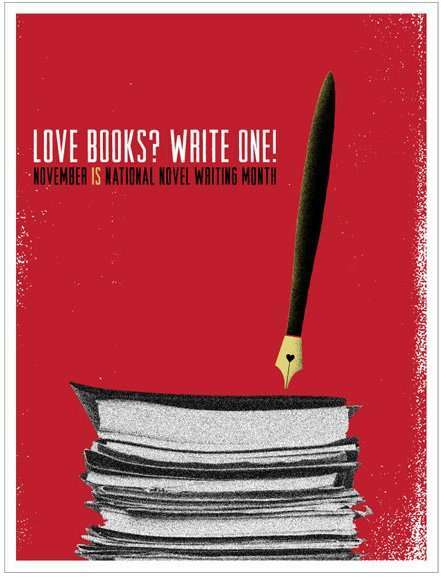 NaNoWriMo is motivation for all of us who plan to write that book some day….to do it now. It is an impetus to create that first draft, which we go on to edit in the following months to get closer to being published. You absolutely rock.Frankly the more i read your posts the more i’m amazed at what you do.Modern day renaissance personalities are rare ,or so i’d heard.But you really are doing what others would gladly procrastinate over.It’s inspiring. Even if it sounds as if I’m lathering a bit too much here,i dont really care what anyone thinks.I honestly compliment you and your go getter mentality. Besides thanks for bringing out the NaNoWriMo competition.I didn’t know such a thing existed. Will have to think about the participation part though. I actually did it twice.. I think 2005 and 2007. Sigh. I dont even know if I have the badges online anymore but back then, there was such a feeling of euphoria when I completed. It will take quite a bit of commitment and planning so all the best. And yes, a part of me wishes to join you… but I don’t know if I have any story in my head for that. I am still thinking about it. I didn’t realize I could do a non-fiction. I have my outline still staring at me since we got home from our travels. My daughter has signed up, written her plot and is working on her character development. Vidya ji, do let us know when your books are published. I love your posts so much for their liveliness and meaningfulness. Love the quote by Morrison! You are such great teacher & … Dedicated. Love you more than NaNoWriMo. btw, my book was edited…now I need to fix it…then I need to decide what to do w/ it! Thanks to you guys I found this awesome thing! And yes I am going for it! Superbly excited and amazingly charged up for this is me!! Vidya, this would be so useful as I might just join in this year. Thanks for sharing these great tips! I wish you the best. I have no doubt that you will be able to do this once again, and that you will not miss the deadline either! 😉 You have a great plan in place. Best of luck to you. 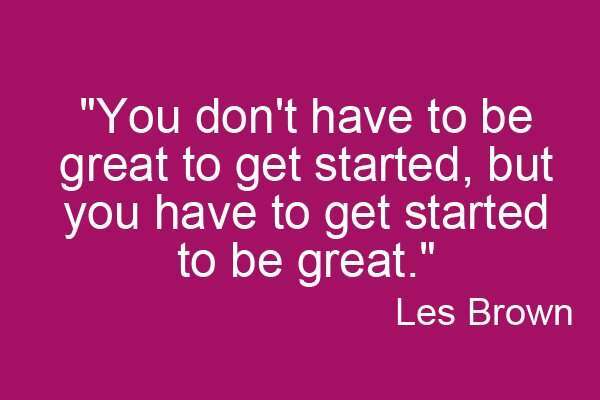 Prioritizing is essential and you have to shut up that inner critique to even get started much less finished in time. You give some great tips and insight into Nano. Thanks for sharing. Thanks a lot, Vidya – I really love those writing & balanced living tips. Unfortunately, it’s very difficult for me, to snap my finger and to go writing – every day. Certain days, I’m in the flow and I can write 3000, 4000 words without that much effort and on other days, it’s difficult to get into the flow for a simple 500 word article – and on those days I typically focus on tasks that demand less creativity. 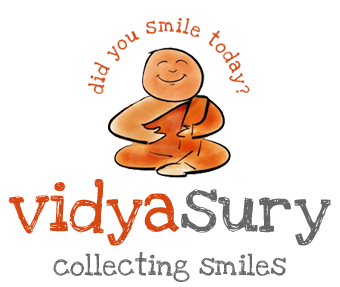 Super tips Vidya…and no-one can rise to this challenge as well as you. I’m with Mona I’m always in awe of what you accomplish on a daily basis. Fantastic! I am not a fiction writer, and I already wrote my book on becoming a professional intuitive, but I do get told often that writing my family’s story would make a good humor book 🙂 Maybe I will write alongside you in November. Kaarina Dillabough recently posted…Would You Like To Be “ON THE EH TEAM”? I totally get that, Kaarina! But as we both know, the fun is in the writing! Signing up is just a temporary aside. You’re the best buddy I can think of. Yep, November, bring it on (standing with hands on hips!) Hugs! So glad we’re in this together! Hi Andi! 🙂 Buddied up and ready to go! 😀 I don’t have an outline yet, but I’ve got a plan. All the best to you! Let’s keep track of each other!